The Visible Dust Arctic Butterfly 724 (Super Bright) is now equipped with 2 super bright LEDs that illuminate the sensor while in operation. 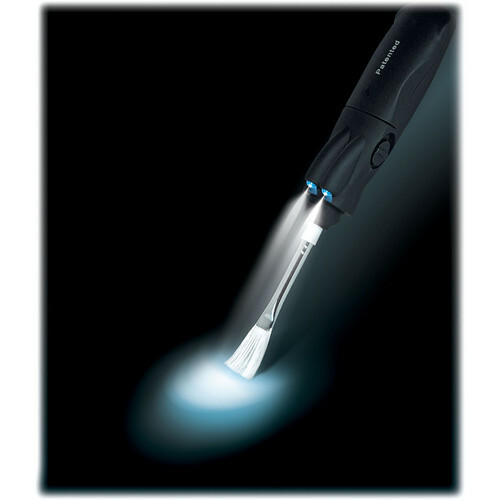 This illumination reduces the possibility of fibers being dragged accidentally against the surrounding cavity hence reducing the potential cause of smear usually caused by contaminated fibers. With the LED as a guide, it becomes easier to spot dust particles. The internal engine meets certain RPM standards and also creates a centrifugal force that enhances dust rejection as well as bolstering the charge enhancement of fibers. These combined patented features that include SCF (Super Charged Fibers) makes the Arctic Butterfly 724 (Super Bright) a superb sensor cleaning tool. These enhancements involve nano-coating technology for charge enhancements as well as by using super thin fibers for maximum lift capability along the rotary motion for cleaning/charging - all without the use of canned air. Because of its safety features, all models of Arctic Butterfly can be safely used on ITO (Indium Tin Oxide) coated sensor and DLSR's with built in sensor cleaning systems. Box Dimensions (LxWxH) 9.5 x 2.5 x 1.6"
Arctic Butterfly 724 (Super Bright) is rated 3.3 out of 5 by 46. Rated 4 out of 5 by Anonymous from You have to know how to use it. I give 4 stars not 5 mainly because it's not perfect. First you have to activate it few second to create static on the brush.. then you turn it off. The you use the invisible static field that surrounds the brush to capture the small dust.. The idea is to gently make all dust to stick to the brush.. I see crazy people turning on the brush while its inside the DSLR.. NO ! thats not how you use this lol Mine is few years old and still working. It is much better than blowing air as blowing can move the dust deeper inside the camera and reach area that are more difficult to remove from.. i.e: the viewfinder. Like i said, learn how to use it. Rated 2 out of 5 by Atlanta Shooter from I would choose another method I have 3 digital dslrs and finally bit the bullet to clean the sensor myself with more than a blower. I, like most of you I'm sure, studied multiple popular websites on the subject and I decided to purchase the Butterfly as the third method in the sequence of cleaning methods (in camera shake, blower, sensor swipe with brush and finally using a solution on the sensor). This product worked fine but I don't think it is a good value at all. It is not very well constructed (others have noted it's poor quality and I agree) for the money they charge. If I were to decide again I would go to the cleaning solutions for the sensor. More reliable and far less expensive. Rated 1 out of 5 by Anonymous from Terrible Product This product is so badly made it is astonishing to discover it is made in Canada. I got the badly-fitting battery compartment lid off, inserted batteries, switched on with the stiff, imprecise switch, and WHAM! Off flew the brush attachment, to the other side of the room. On inspection, the plastic attachment is split and there's no way it will fit on the handle securely without super glue. I'm going to be returning this piece of junk for a full refund. Don't waste your money. Visible Dust should be ashamed of themselves peddling this rubbish. Rated 1 out of 5 by Steve Pierce from DangerousDesign, brush can fly off The Artic Butterfly 724 has a fatal flaw which ensures your cleaner will break and fail. It is hard these days to design a product with 100% failure, but they have. The nonconductive ferrule shaft (it is white in the photos) is apparently made of a soft plastic that easily cracks. The shaft can develop hairline cracks where the brush will not stay securely attached to the DC motor shaft. The brush can then fly off and can lead to personal injury. Every one of these should be recalled until Visible Dust, the manufacturers of the Artic Butterfly, can redesign the brush and attachment point to make sure the the brush cannot fly off. The attached photos show a brand new 724 with the brush that arrived today (12/31/16) that failed on first use. I was fortunate, the brush only hit me in the leg and did not hit me in the eye. I was not wearing eye protection. Nothing in the instructions suggests that eye protection is required during use. Rated 2 out of 5 by Noel from Not The Best Overall, the brush does remove debris however if the debris is more than just dust it won't come off. I had to have my camera professionally cleaned after using this product because the debris would not come off the sensor. Rated 1 out of 5 by Carabell from VERY POOR QUALITY Does not work. Period. Do not buy this product , it does not work! Shame on you Visible Dust for selling a product for this much money that does not operate correctly. The brush flies off the handle when you spin it to charge the bristles. The product gets one star because rating it a no stars is not an option. The Butterfly only comes with one brush and the size is slightly smaller in width then a swap for a cropped sensor. Typically you will go over the sensor more than once, but it's one swipe in one direction at a time then pulling the brush out and spinning it to remove dust and create a static charge and repeat as needed. Be careful to ensure that the brush is securely on the unit. My brush flew off after two spins and landed on the floor that required i get a replacement brush. However, it does remove light dust as advertised. With so many reported issues with this device why doesnt B&amp;H continue to offer it?